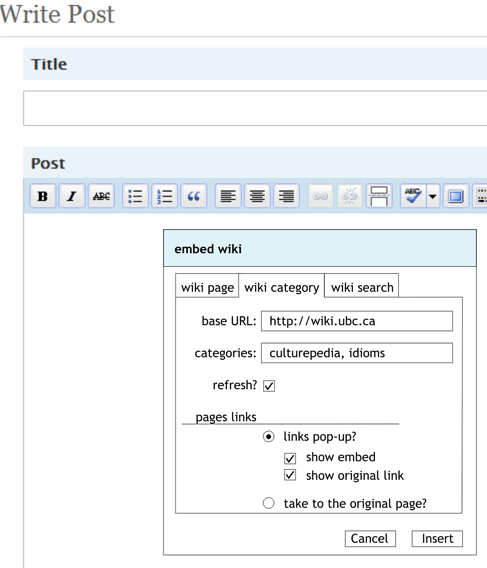 Today, after thorough testing, we have enabled the wiki books extension on our UBC wiki server. In a nutshell, it compiles user-selected pages to user’s own collection that can be sorted, saved as a book, and printed to PDF. It is by far the most complex extension we have enabled so far: it requires certain python, C++ and perl libraries in order to print to PDF and we have setup external server to handle resource-heavy PDF creation to keep main UBC wiki server fast and happy. It is based on Collection extension and you also need mwlib. Overview is here. Scott McMillan, that btw takes all the credit for installing this beast, will soon blog about important back-end steps that are left-out from this otherwise nice article. For now, it is available only for logged-in users (you have to have CWL to see it and try it out). wikieducator.org and wikibooks.org both run it so in case you don’t have CWL, try it there. Office of Learning Technology publishes annual Faculty Resource Guide (FRG), a nicely designed and printed handbook that is also available as a PDF. Like with every printed publication, it takes time and effort (read money) to keep it current: we have annual design refreshing cycle, up-to date information edited and send back and forth to designer, the whole file sent to printer etc. As a big step forward, we have established Faculty Resource Guide blog (http://blogs.ubc.ca/frg/) to make content authoring and keeping it up-to date a bit easier and available online to UBC faculty. Faculty member could still not print the whole latest version of the book easily, as there is no easy way to send the content of the website to PDF or printer, one could do it only on page-by-page basis. Our FRG, just like every book should have a title page, so here it is in wiki flavour: it is nothing like a regular cover, we have instead: Short intro, links to contents (chapters), link to printable version (all pages manually aggregated – transcluded) of the whole book and link to PDF. Very simple and still nothing special so far – now let’s see how wikibooks thingy kicks in: When you’re logged in with your CWL, you will see the link Create a book on the left hand side, just below navigation box. Once you click on it and start your new book, every wiki page will have an option on the top to add that page to your book collection. So, I might choose to compile a few pages from our Faculty Resource Guide (let’s say eLearning Tools and Distance Learning) but also add a few other pages from UBC wiki, let’s say WordPress FAQ and Online Teaching pages. Now, I’ve got my own new book and I will save it as eLearning Tools and Distance Learning at UBC. I can also create my own chapters and drag and drop pages appropriately. Finally, in addition to saving a book under my own user’s space (User:Nrogic/Books/ eLearning Tools and Distance Learning at UBC), I could also make it part of the overall Books space: (UBC Wiki:Books/eLearning Tools and Distance Learning at UBC). Very cool, this could work well for all sorts of support and training and lab manuals as well as for course content. Try it yourself! Yesterday, Scott McMillan and I met with Joanne Fox and David Ng to discuss potential support and ideas that OLT could contribute to their get-your-biodiversity-easy-as-Pokémon project, where they will try to use Pokemon principles that appeal to kids (cards collecting, memorization of skills, games) plus a bit of Web2.0 mashups to run it online. I was always impressed with just how much information about various Pokémon kids can memorize. My then-7-years-old son knew pretty much all 150 plus Pokémon along with most of their types, skills and evolutions. Compare that with their ability to memorize stuff for school! It seems that simple setup, few inter-connected blogs and wikis and a few web services (flickr and Big Huge Labs) could get them far in terms of having awesome site for kids (end users), while still supporting various other interested groups and communities around this project: graphic designers (to submit their designs), scientists (organizing material and writing cards and games contents), school teachers (case studies, ideas). Overall great conversation, we are looking forward to be involved!It seems that simple setup, few inter-connected blogs and wikis and a few web services (flickr and Big Huge Labs) could get them far in terms of having awesome site for kids (end users), while still supporting various other interested groups and communities around this project: graphic designers (to submit their designs), scientists (organizing material and writing cards and games contents), school teachers (case studies, ideas). Overall great conversation, we are looking forward to be involved!